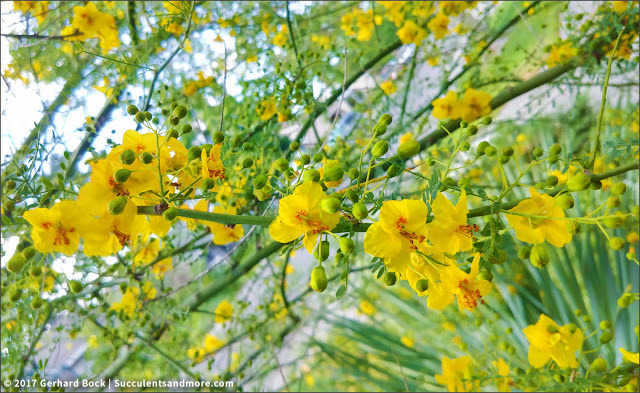 If you've followed my blog for any length of time, you know that the palo verde (Parkinsonia), especially the 'Desert Museum' hybrid, is one of my favorite trees. While 'Desert Museum' is common in Arizona and Southern California, it's still fairly rare here in Northern California. In this post from September 2013 I detail my quest to find one. 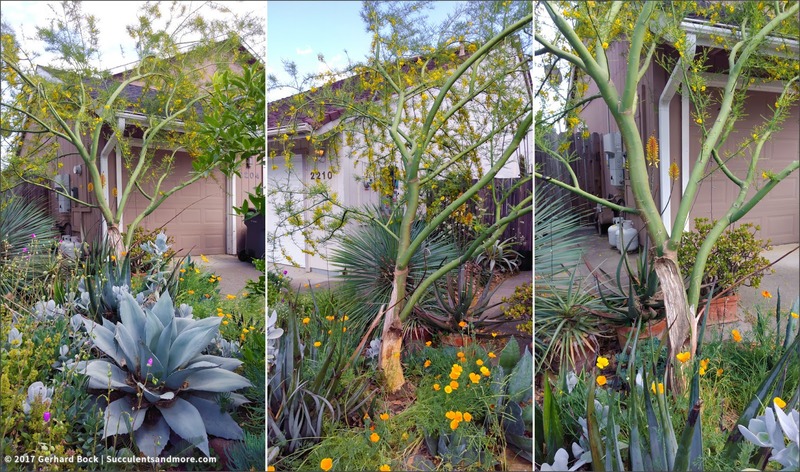 We eventually planted two 'Desert Museum' and one 'Sonoran Emerald' (a different palo verde hybrid). Everything went well until January of this year when a major branch--half of the tree it seemed--broke off in a windstorm. See this post for details and photos. We removed the fallen branch and cleaned up the debris. Over time, the scar healed and by late April the tree was covered with flower buds. It had been a windy night--windy enough to cause the tree to break in half yet again. When my wife sent me these photos, all I could do was sigh. What I'd hoped wouldn't happen, did happen. The tree clearly wasn't stable after the calamity in January. It looked like the branch had fallen squarely onto my prized Agave 'Sun Glow'. Fortunately, 'Sun Glow' turned out to be completely unharmed. Whew. Literally half of it is gone now. We've decided to leave what's left because the tree is in full bloom and attracts countless bees every day. 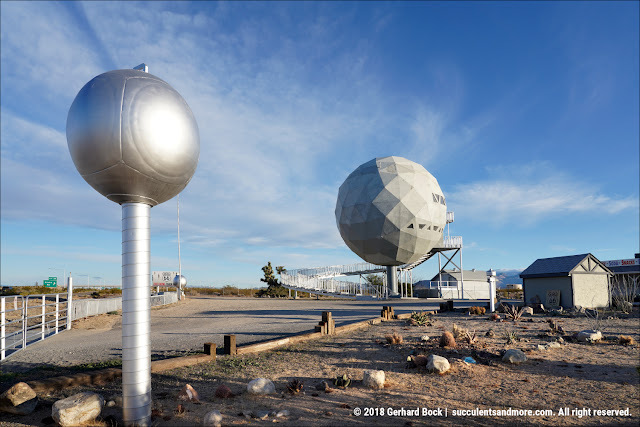 In the fall, we will remove what's left and start over with another 'Desert Museum'. Yes, we love it that much. And now we know a lot more how to handle this fast-growing tree. Specifically, PRUNE PRUNE PRUNE. This is especially important when young. 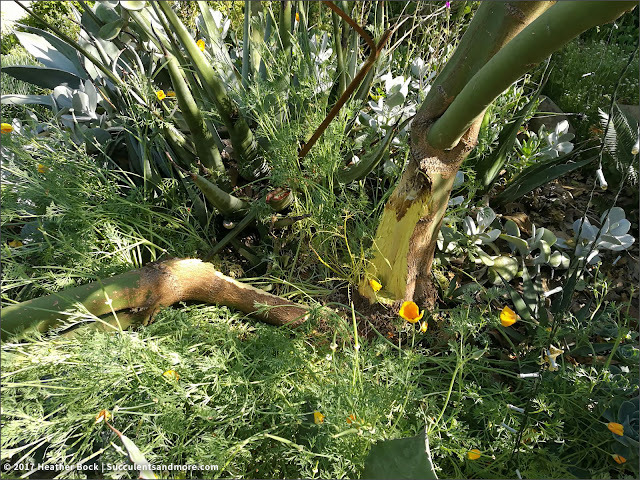 We were much too hesitant with this tree, not knowing that branches that grow at too acute an angle to the main trunk are susceptible to bark inclusion that weakens the branch. While palo verdes are naturally multi-trunked, for our purposes it's better to have one main trunk, with a controlled number of side branches. In addition, I will not water the new tree at all. If we plant it in October, it should survive on rainfall alone. And next year, its roots can go hunting for water. The slower the tree grows, the sturdier its branches will be. I think this one simply grew too fast. Oh, that's sad. I like Palo Verde trees, too. At least it doesn't look to have caused any damage, and now you know how to better handle the next one. 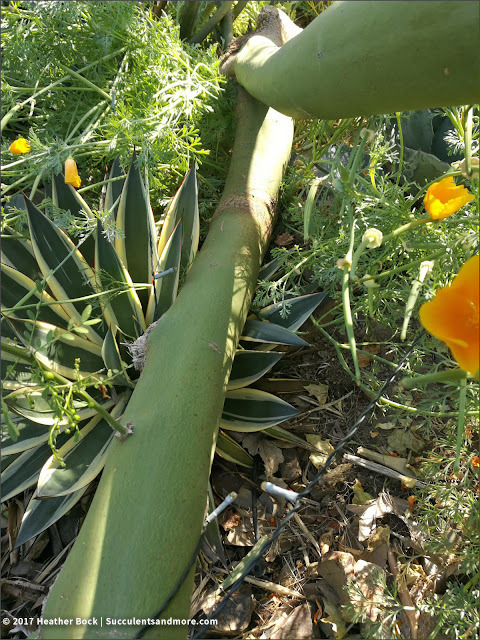 I'm still surprised that there was virtually no damage either time this happened (just a few broken leaves on an agave and aloe nearby). I'm sorry this happened! 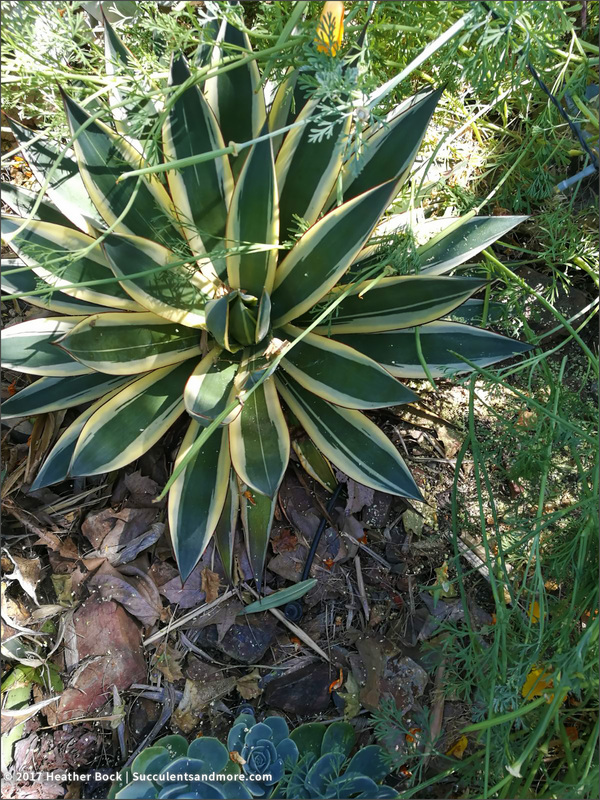 I have also learned to not water my drought tolerant plants too much -- I have agaves that are now bigger than me and will likely bloom much earlier than they should. 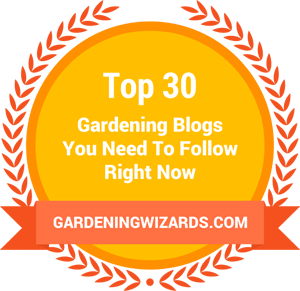 I've turned off all my watering to my yard, and can give it a spritz once a month if I need to! I've learned to be a lot more ruthless and pamper desert plants far less than I used to. They can take it!! Oh my :( but your plan seems sound and very sensible. 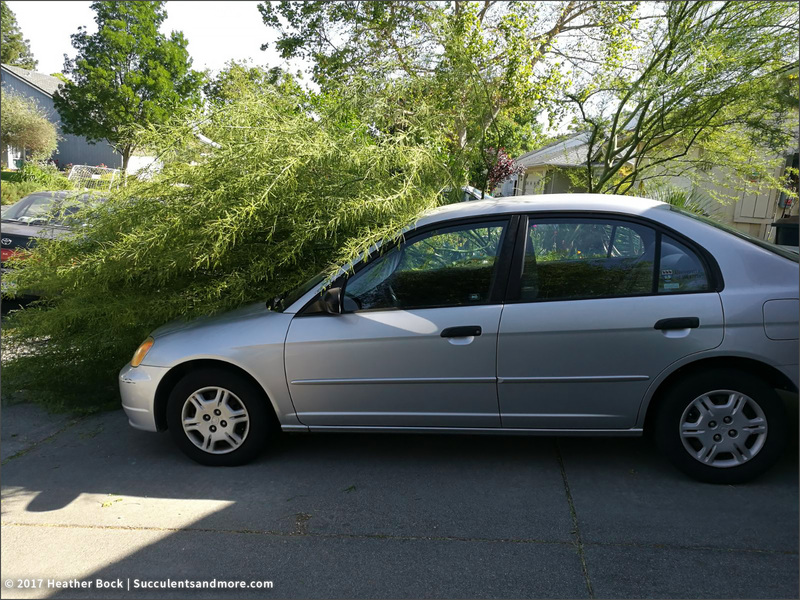 We've had something similar happen to our Rhus, twice mind you and two different trees. Pruning seems the right way to go. I must admit that proper pruning is still a bit of a mystery. Fortunately there's a lot of information online and in books. I just need to take the time to read it. I'm glad you have a plan, and at least they grow fast. Trees are always in need of management--I had 1 removed and two limbed up today. What a difference. Oh no! I'm glad your agave was unharmed. 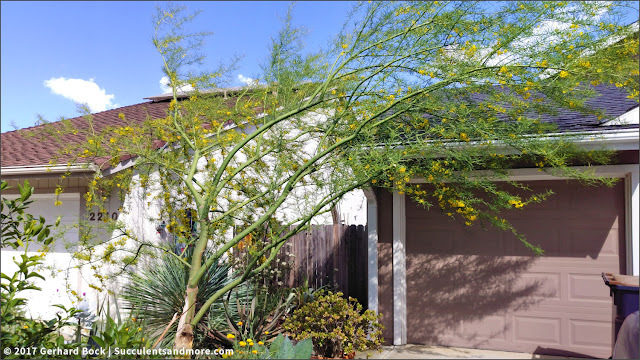 This just reminds me that I really should prune my Palo Verde to shape it better... But I'm so worried that I'll do something wrong! Maybe after it blooms? Best of luck with this one! Your plan for the future sounds wise. So glad your 'Sun Glow' was okay! Oh thank god 'Sun Glow' was unharmed! I trust Heather sent you an "all's okay" photo right away so your didn't have to wait until you got home to see for yourself? So sorry about the beautiful tree. I loved that tree! I'm so sorry, Gerhard. But grateful you had no collateral damage. So sorry, hard to be far away when these things happen! I'd be heartbroken too. I hope the pruning strategy proves to be the trick with its replacement. Wow, so sorry to see all that damage! My little tree is staked, it has to be subjected to a lots of southerly wind all the time. I'm going to have to pay close attention to its structure. I don't want it to end up like this! Hope to see the new tree in a post when it's time to replace. 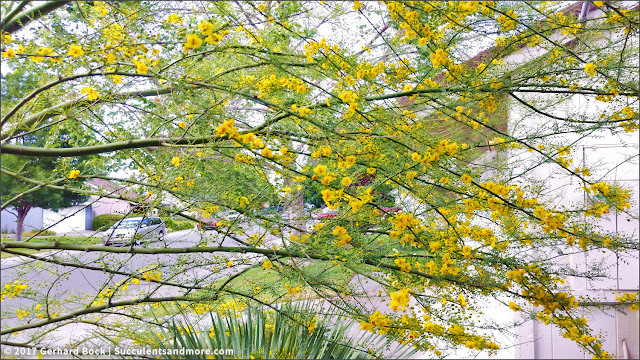 They are gorgeous trees, but the exceptionally fast growth does require frequent corrective pruning to avoid surprises. The curse of fast growing trees, I've learned to be relentless, pruning up to 4 a year. I'm about to purchase 3 Palo Verde Desert Museums. I'm in California, zone 9. We are usually in drought conditions here, so I use drip irrigation. How much and how often do you recommend I water? Having learned from my past mistakes, water them just enough so they get established. Maybe once every other week in the summer. After that, they shouldn't need any supplemental water. You do NOT want them to grow too fast. 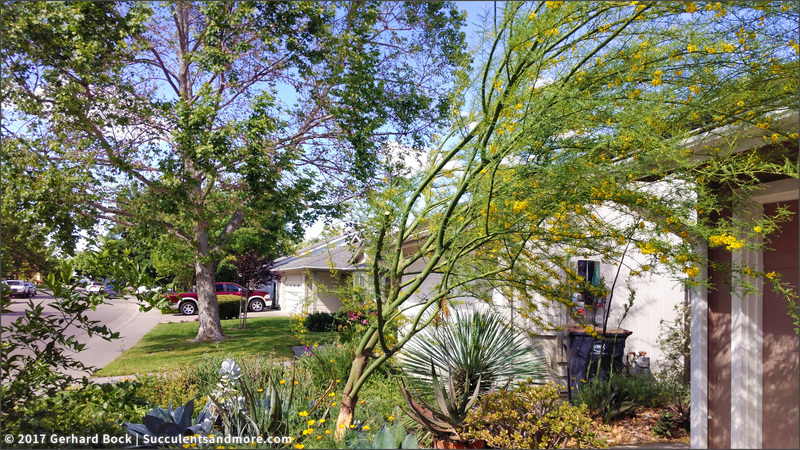 My palo verde has had some powdery mildew on it in the spring. last year I got so panicked because of that and the fact that it never bloomed that i trimmed it too much. It has grow back over the last year but there still is some powdery stuff on the leaves, and tons of little bud clusters growing but they won't open to show the flower! It's 3-4 years old and the first two years I had so many flowers. I am wondering if something is wrong with it!? Some of the biggest buds seem to have just stopped growing to open. Maybe I am jumping the gun and everything is fine and will bloom shortly. . . . but curious if you experienced this? Can't find any info online. Erin, I've never seen or heard of powdery mildew on palo verdes. Since you said yours won't flower, there's definitely something wrong. You could spray the leaves with something like Serenade. I hope that helps!